The age-old petrol vs diesel car debate troubles every potential car buyer out there. The decision can be primarily taken based on the economics of buying and running the respective choices. To simply put it we can settle the petrol vs diesel debate by breaking down the factors affecting your decision while choosing a car. Price Difference – A diesel variant tends to be significantly more (varies with each car manufacturer) expensive than its corresponding petrol avatar. This higher initial cost has a major significance in the overall economics of choosing a model, as illustrated later in the article. Cost of Maintenance – The relatively higher maintenance cost of diesel models of yesteryear is no longer true now. This was primarily because of the lower quality of the diesel available in India, which used to clog the diesel filters and cause harm to the engine in the long run. The maintenance cost of diesel, when compared to petrol, is still on the higher side but is quite comparable nowadays. Fuel-Efficient Diesel Motors- Owing to diesel engine technology, they tend to return more kilometres per litre than a similarly sized petrol motor. This factor tends to be the sole reason majority of us tend to go for a diesel variant. But, we urge everyone to consider all the mentioned factors before making a decision. The Difference in Fuel Prices- The lower diesel price is a reality, with the price difference between a litre of petrol and diesel generally hovering 10 rupees. Now take the example of Suzuki Baleno which is selling like hotcakes in the premium hatchback segment in India. The top-of-the-line petrol and diesel Alpha manual variants are priced at Rs 7.29 and Rs 8.43 (ex-showroom) lakh, respectively. A difference of Rs 1.14 lakh, in favour of the petrol variant. Since the cost of maintenance for both petrol and diesel variants being comparable, we are excluding the same from the calculation. Now to the important factor of fuel-efficiency, the petrol model is tested to return 21 km/l while the similar diesel variant returns 27 km/l. A difference of six kilometres per litre, in favour of diesel. With fuel prices being adjusted per global crude oil prices every day, we are taking an average difference of Rs 10 per litre between diesel and petrol. Now let’s get started on how many years it would take one to cover up the additional cost paid upfront for a diesel variant. Based on different research, we are assuming that an average car does 15,000 kilometres in a year. So, basically to cover up the difference in ex-showroom price (Rs 1.14 lakh) paid up front, one would have to keep the car for more than six years! There you go, if your car sees an average annual mileage of say less than 15000 – 20,000 kilometres per year, it’s good to stick to a petrol car. More importantly, the money you save by not spending extra for a diesel variant can be utilized to opt for more safety options in your car, or basically put in a fixed deposit to earn interest out of it. 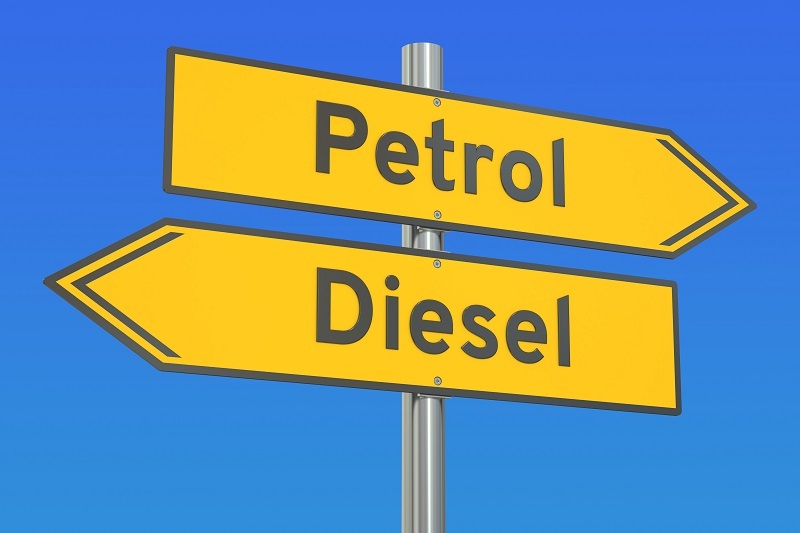 Diesel motors also tend to emit more nitrogen dioxide and particulate matter than their petrol counterparts, hence helping the environment in the short run. PS – petrol motors emit more carbon dioxide compared to diesel, hence contributing to global warming and harming the environment in the long run. We urge you to calculate in similar ways while opting for a car whether it be a used or a new car to find out if you are making the right decision. Do check out cars24.com if you are planning to upgrade and looking to sell off your used car. We guarantee the best price, instant payment and free documentation, which in turn gives you more time to make the right decision regarding your next purchase.